Welcome to the Whitehead Light Station... offering programs for adults at an historic lighthouse in the heart of the Maine coast. It was Thomas Jefferson’s signature that authorized the construction of a small dwelling and a stone lighthouse in 1803 on Whitehead Island, which lies at the mouth of Penobscot Bay. Ever since, the Whitehead Light Station has provided a beacon to mariners making their way up and down the Maine Coast. In 1982 Whitehead Light Station was automated and, while the lighthouse continued to operate, the dwellings and outbuildings were shuttered and abandoned. In 1996, through the Maine Lights Program, Pine Island Camp became owner of the Whitehead Light Station and began renovations. The restoration process was completed in 2008 and the result is a facility that is remote but comfortable with a private bath in each room, electricity, and comfortable common areas, including a library. 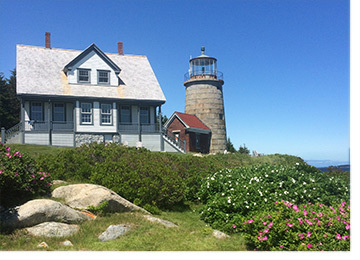 Today the Light Station continues to provide a beacon to mariners from its granite lighthouse, and it has a new mission: to provide programming for adults that will give them the opportunity to experience life at a historic Maine island light station, to step out of the busy world of the mainland, and to gain knowledge of specific subjects, the Maine coast, and themselves. Adult Enrichment Programs: Adults will have the opportunity to enroll in three- to five-day programs that focus on a variety of subjects and activities taught by an instructor. In addition to instruction, discussion, and lectures where appropriate, we will provide transportation to and from the island, all meals (sample menu), and local excursions in the Whitehead Light Station boat. Although most rooms will be double occupancy, single rooms will also be available for an extra fee. Facility Rental: The entire facility is available to rent for up to seven days and six nights. 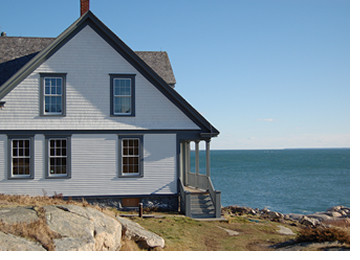 The rental will include seven bedrooms, each with its own bathroom, the use of common areas and the kitchen, transportation to and from the island, and the use of the Whitehead Light Station boat, piloted by the captain, as needed for trips ashore and to explore the neighboring islands. Participants in the rental will set their own schedule and have the run of the 11-acre site, which includes spruce woods and the unique rocky shoreline.